THE Bohol board member, who allegedly kidnapped and killed his wife, a town mayor, will be charged with parricide and not murder, according to Regional Intelligence Division (RID)-Central Visayas Chief Jonathan Cabal. Bohol Board Member Niño Rey Boniel allegedly kidnapped and shot his wife, Bien Unido Mayor Gisela Bendong-Boniel, and threw her body into the sea. Nino Rey will also be charged with serious illegal detention and kidnapping. The parricide case will be filed in Lapu-Lapu Regional Trial Court, since the victim was shot in Lapu-Lapu City, while the serious illegal detention and kidnapping charges will be filed in Tagbilaran Regional Trial Court in Tagbilaran, Bohol, where the mayor and her friend, Angela Leyson, were held. Before the incident, Leyson and Gisela were staying at a dive camp in Bien Unido, Bohol. Leyson said around 2 a.m. of June 7, six to eight people entered the room where she and the mayor were sleeping. One of the men pointed a gun to her head, wrapped her face with duct tape, tasered her neck, and stomped onto her until she kneeled. On Friday, June 9, Leyson showed her bruises and wounds to the media. She also told the reporters about Niño Rey and Gisela’s "problematic" marriage. Police Regional Director-Central Visayas Noli Taliño said they were able to arrest five of the seven suspects of the crime. 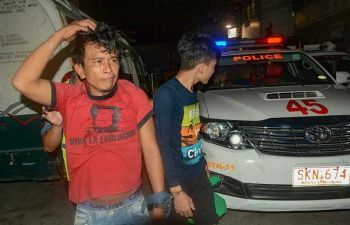 This was echoed by Cabal who said suspects Niño Rey; Randel Lupas, the driver; Royelito "Etad" Boniel, Niño Rey's first cousin; and two others were arrested, but contrary to Taliño's statement, Calab said there were still three more suspects to be apprehended. Etad Boniel, one of the witnesses and suspects of the crime, said the board member wrapped Gisela's body with a fishing net and put two stones weighing 30 kilos before she was thrown into the sea off Caubian Island in Lapu-Lapu City. Etad, who is also the cousin of the suspect, said he just steered the banca after he was called by the board member to go to the dive camp where the mayor and her friend were staying. A search operation was conducted Friday morning, June 9, to retrieve the body of Gisela. As of Friday afternoon, June 9, Niño Rey Boniel and Etad were transported back to Bohol, while the body of the victim has not yet been found.